BANGKOK (AP) — Shares have declined in most Asian markets, tracking an overnight sell-off on Wall Street. But stocks in Shanghai and Shenzhen advanced early Tuesday after the government set an ambitious target for growth this year that implies strong government support for the economy. The Shanghai Composite index rose 0.1 percent to 3,031.00, while the benchmark in Shenzhen, a smaller, more domestic-oriented market jumped 0.8 percent to 1,685.17. Chinese Premier Li Keqiang told the annual session of the country’s rubber-stamp parliament that the government was setting a growth target in a range of 6 to 6.5 percent. That shows official determination to shore up the cooling economy and prevent politically hazardous job losses and is slightly below last year’s 6.6 percent growth, a three-decade low. Li promised higher spending on technology development. Beijing is also aiming to raise military spending by 7.5 percent. Japan’s Nikkei 225 index lost 0.5 percent to 21,714.70 and the Hang Seng in Hong Kong edged 0.1 percent lower to 28,932.74. 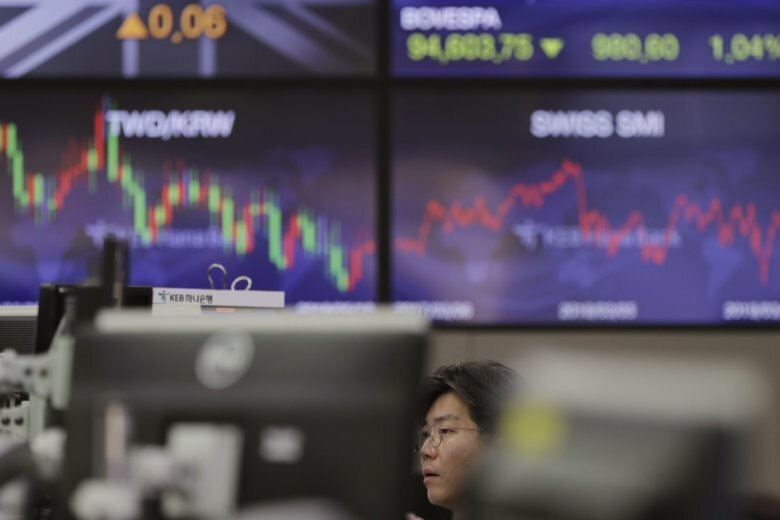 South Korea’s Kospi dropped 0.5 percent to 2,178.75. The S&P 500 index dropped 0.4 percent to 2,792.81. The index, a benchmark for many mutual funds, is still up 11.4 percent so far this year. The Dow Jones Industrial Average fell 0.8 percent, to 25,819.65, while the Nasdaq composite lost 0.2 percent to 7,577.57. The Russell 2000 index of smaller companies gave up 14.20 points, or 0.9 percent, to 1,575.44. ENERGY: U.S. crude lost 30 cents to $56.29 per barrel in electronic trading on the New York Mercantile Exchange. It rose 1.4 percent Monday to settle at $56.59 a barrel in New York. Brent crude, used to price international oils, fell 28 cents to $65.39 a barrel. CURRENCIES: The dollar rose to 111.91 yen from 111.74 yen on Monday. The euro weakened to $1.1327 from $1.1341.